This is a Yellow version of the red brain Strain we have been developing this Strain for over 3 years of selecting and reselecting. The mother plant was sent to us by our Trinidadian friend Sara Ragonanan she marked the seeds as Trinidad 7 pod SR Yellow. Among all the plants, we have noticed that this particular plant produces what looked like the Red Brian Strain discovered by David Cappiello from NC. Pod size, shape, even heat seems to be very similar except the yellow one smells and tastes like a mixture of pineapple and 7pod together which will make great yellow homemade hot sauce . When u cut the pod u can actually see the placenta full of capsicum oil. 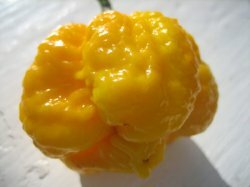 One of the hottest if not the hottest yellow variety there is it defiantly worth trying if you like to have extremely hot 7pod taste, with topical fruity taste Many Chili Pepper fans around the world claim that this may be the hottest pepper in the world, just hasnt been scientifically tested yet.